Forward March Posse a polští Splendid Sound spojili síly a původně vratislavský Melting Pot Clash přesouvají do Prahy. Hlavní myšlenkou tohoto clashe vždy bylo dát prostor soundům z bývalého Východního bloku. Ani v roce 2019 tomu nebude jinak. O titul se utkají domácí Peeni Walli, polští Sensithief a slovenští Ghetto Youths sound. Utkají se ve třech kolech, po kterých publikum vybere dva postupující do velkého finále. Tím je dub fi dub, kde každý sound zahraje sedm dubplatů. A po něm návštěvníci vyberou výherce. Akce se odehraje 12.4.2019 ve smíchovském klubu Underdog’s. 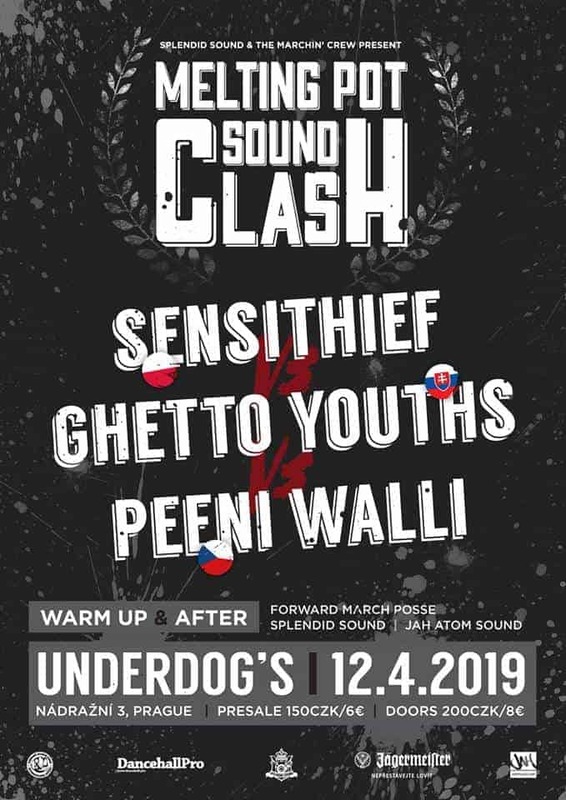 Splendid and Forward March Posse join forces to organize the best soundclash event in this part of Europe – Melting Pot Clash! This clash international and local at the same time. Our aim is to give spotlight to the sounds from our area using a real Jamaican/international formula. Being a niche within a niche, soundclash is a form of entertainment that deserves much more exposure and we’re about to ensure it! To do that, we decided that the first step was to move it to a more attractive location – Prague. After two editions in Wroclaw, we take a leap to our (more cool) neighbours and do something bigger. This means more central location and more transport options, more free time activities (yes, you know what we mean…lol) and hopefully more vibes! The second step was inviting sounds that would attract attention and this year we believe we’ve managed to book the best possible line up – Sensithief from Poland, Peeni Walli from Czech Republic and Ghetto Youths from Slovakia. Three different countries, three different musical and socio-economical realities but similar roots and background. Three sounds that have been playing Reggae and Dancehall music relatively long but are still hungry for more. Finally, three different ways of playing music. A melting pot, where things gonna boil real quick! After this round one sound drops out. If one sound clearly dominates the clash, lock off is possible. 4. Dub fi dub – 7 songs each; no interuptions between the songs, one vote in the end. All this will be overlooked by the hosts – Fubatan from Forward March Posse and Szczepan from Splendid Sound. We’re reaching out to all sound system fans in Eastern Europe – forward to Prague on 12th April to support the movement and, most importantly, to enjoy a hell of a night! See you! Pull Up Unity dnes vypustili nový videoklip před blížícím se albem!